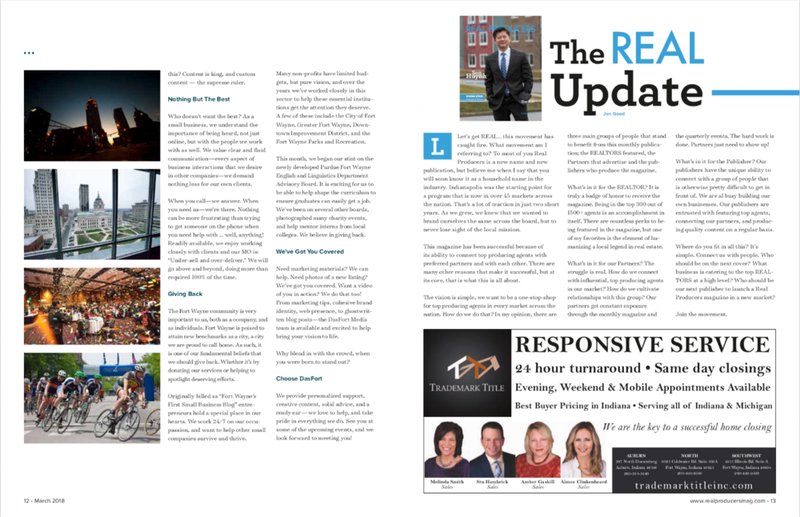 March marks the second issue of Fort Wayne Real Producers, a real estate publication highlighting top producers in the Northeast Indiana area. This month, Son Huynh with Century 21 Bradley graced the cover, discussing the difference between clients and friends. His answer? Not much! Licensed for nearly twelve years as a real estate agent, and with over $11 million sold last year, he understands how to truly connect with people and how to care for them properly. Born in South Vietnam, Son moved to the US at the age of seventeen. 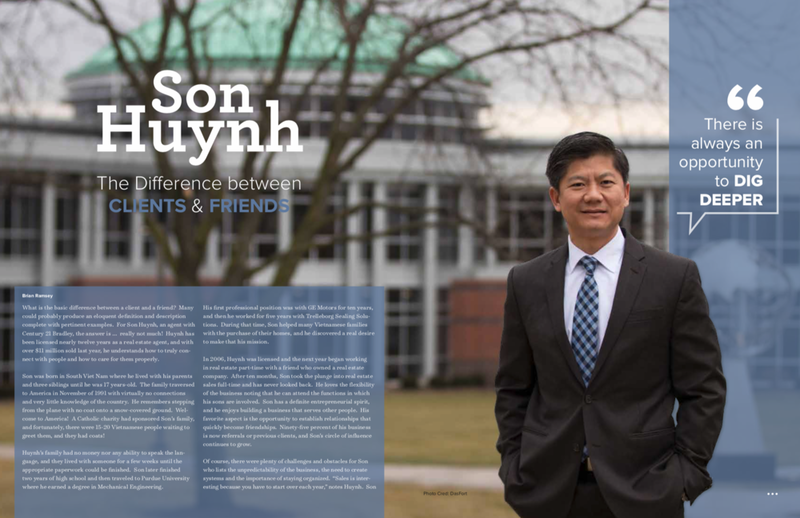 After earning a degree from Purdue University and working a couple jobs, Son began to help other Vietnamese families with the purchase of their homes—which sparked a real desire to help even more people. "His favorite aspect is the opportunity to establish relationships that quickly become friendships. Ninety-five percent of his business is now referrals or previous clients, and Son's circle of influence continues to grow." Educating clients, and taking on an active role in the community by volunteering and giving back are important aspects of Son's approach to life. "Serving the community may often take longer, but for Son, it is about making a difference in others' lives and letting them know that you desire to invest in them." Congratulations on this feature, Son! Raegan Perkey with F.C. Tucker/Malcolm & Schlueter Realtors was March's "Rising Star. Raegan Perkey, March's "Rising Star"
As part of the Fort Wayne Real Producers team, we were honored with the "Sponsor Spotlight" for the month. What exactly does that mean? It boils down to this—if it can be photographed, recorded in any way, and built online—DasFort has you covered. Focusing on custom content creation that sets brands, companies, and individuals apart from the crowd is our main prerogative. But what makes DasFort different from any other media company? Fortune favors the bold, and our core team reflects this principle. Eleven years ago Tony Frantz, a lifelong Fort Wayne resident, branched out on his own and founded DasFort Media. Growing up in a family business, Tony learned the importance of truly taking care of customers. With over twenty years experience in sales and customer service, he was well tuned to understanding, and channeling, individual client wants and needs. Since then, DasFort has developed and evolved as a company, from commercial photography and video, to brand consulting and web development. With the social media boom and the digital age we understand how important it is to be represented in the best possible light online. Clear photos, informative videos, and an eye-pleasing presentation of these on a beautiful, clean website are integral for any professional web presence. In 2013 Laura Noggle came on board as editor-in-chief, media strategist, video producer, and web content curator. After spending seven years living in Asia, she was well tuned to the importance of technology for communication, and business success. Together Tony and Laura manage seven distinct brands under DasFort Media, in addition to many client accounts. Throughout the past decade, DasFort has navigated changes in the digital industry and embraced cutting-edge technology in order to adapt and stay relevant—making sure our clients move forward with us at the highest possible level. Transformation is a constant in any industry, and even more so in the tech world. One thing that has not changed since the beginning, are the keystone values inherent in all our business dealings. The midwest is often thought of as “wholesome” and DasFort fully believes in strong business ethics as well as providing the best and most unique experience to every client. What can DasFort do for you, as a realtor? While we have many different kinds of clients, realtors are one of our favorite clients to serve. Maybe because we love architecture and design, or maybe because realtors really have to be on the forefront of all digital trends, from crisp illustrative photography, to actually reaching potential buyers. After starting out as a photography studio, DasFort has grown into a full-blown media agency. We produce custom videos, craft scripts, provide copy writing services, and consult clients as they navigate the ever changing digital waters. Whether it’s building a custom website to showcase beautiful photography and unique videos, or updating blogs with informative market trends—we can help. The main point is—you, as a realtor, need to distinguish yourself from all the other realtors. How do you do this? Content is king, and custom content — the supreme ruler. Who doesn’t want the best? As a small business, we understand the importance of being heard, not just online, but with the people we work with as well. We value clear and fluid communication—every aspect of business interactions that we desire in other companies—we demand nothing less for our own clients. When you call—we answer. When you need us—we’re there. Nothing can be more frustrating than trying to get someone on the phone when you need help with … well, anything! Readily available, we enjoy working closely with clients and our MO is: “Under-sell and over-deliver.” We will go above and beyond, doing more than required 100% of the time. The Fort Wayne community is very important to us, both as a company, and as individuals. Fort Wayne is poised to attain new benchmarks as a city, a city we are proud to call home. As such, it is one of our fundamental beliefs that we should give back. Whether it’s by donating our services, or helping to spotlight deserving efforts. Originally billed as “Fort Wayne’s First Small Business Blog” entrepreneurs hold a special place in our hearts. We work 24/7 on our occupassion, and want to help other small companies survive and thrive. Many non-profits have limited budgets, but pure vision, and over the years we’ve worked closely in this sector to help these essential institutes get the attention they deserve. A few of these include the City of Fort Wayne, Greater Fort Wayne, Downtown Improvement District, and the Fort Wayne Parks and Recreation. This month, we began our stint on the newly developed Purdue Fort Wayne English and Linguistics Department Advisory Board. It is exciting for us to be able to help shape the curriculum to ensure graduates can easily get a job. We've been on several other boards, photographed many charity events, and help mentor interns from local colleges. We believe in giving back. Need marketing materials? We can help. Need photos of a new listing? We’ve got you covered. Want a video of you in action? We do that too! From marketing tips, cohesive brand identity, web presence, to ghost written blog posts—the DasFort Media team is available and excited to help bring your vision to life. Why blend in with the crowd, when you were born to stand out? We provide personalized support, creative content, solid advice, and a ready ear—we love to help, and take pride in everything we do. See you at some of the upcoming events, and we look forward to meeting you!" "Let's get REAL... this movement has caught fire. What movement am I referring to? To most of you Real Producers is a new name and new publication, but believe me when I say that you will soon know it as a household name in the industry. Indianapolis was the starting point for a program that is now in over 45 markets across the nation. That's a lot of traction in just two short years. As we grew, we knew that we wanted to brand ourselves the same across the board, but to never lose sight of the local mission. This magazine has been successful because of its ability to connect to top producing agents with preferred partners and with each other. There are many other reasons that make it successful, but at its core, that is what this is all about. The vision is simple, we want to be a one-stop-shop for top producing agents in every market across the nation How do we do that? In my opinion, there are three main groups of people that stand to benefit from this monthly publication; the REALTORS featured, the Partners that advertise and the publishers who produce the magazine. What's in it for the REALTOR? It is truly a badge of honor to receive the magazine. Being in the top 300 out of 1500+ agents is an accomplishment in itself. 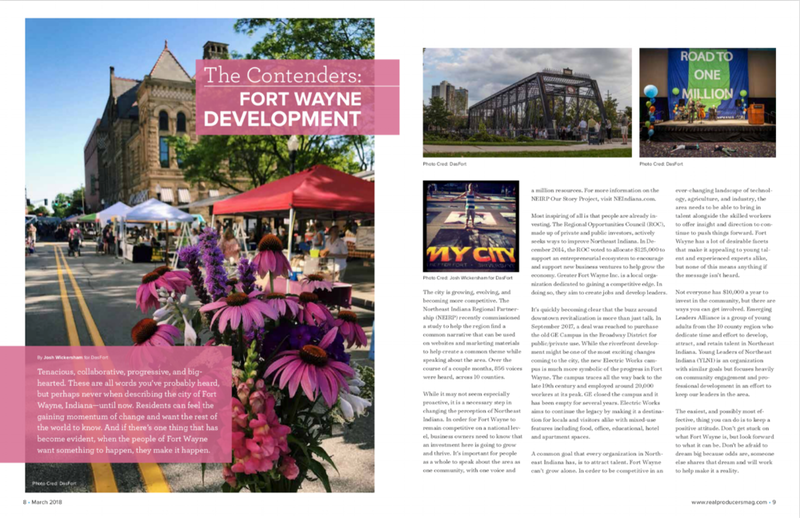 There are countless perks to being featured in the magazine, but one of my favorites is the element of humanizing a local legend in real estate. What's in it for our Partners? The struggle is real. How do we connect with influential, top producing agents in our market? How do we cultivate relationships with this group? Our partners get constant exposure through the monthly magazine and the quarterly events. The hard work is done. Partners just need to show up! What's in it for the Publisher? Our publishers have the unique ability to connect with a group of people that is otherwise pretty difficult to get in front of. We are all busy building our own businesses. Our publishers are entrusted with featuring top agents, connecting our partners, and producing quality content on a regular basis. Where do you fit in all this? It's simple. Connect us with people. Who should be on the next cover? What business is catering to the top REALTORS at a high level? Who should be our next publisher to launch a Real Producers magazine in a new market?